I sat here and had my lunch today. 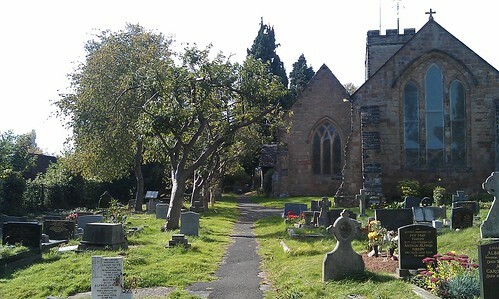 It’s the churchyard of St Laurence’s Church in Northfield. It’s the church where I was christened 40 years ago this summer, it’s also the churchyard where my paternal grandparents are remembered. I attended the CofE primary school next door, which has since been turned into houses, so it’s the church in which I first experienced harvest festivals, carol services, cub scout church parades, the joy of belonging and of community. At school and in church I loved to hear the bible stories and I loved the idea that the church, this church, was God’s house and that he welcomed us in. How cool, to be welcomed in by God! I don’t know where it was along the way that I stopped thinking it was cool but by the time I was a teenager I know I was rebelliously sitting upright and eyes-open in school assemblies when we were supposed to pray. The idea of God as it was presented just seemed more and more preposterous, a way to make people do what you wanted them to do and I became very attached to my identity as an atheist – it was a way to be different, to stand out, to upset other people who were very attached to their beliefs. I don’t feel like that today. I don’t attend any church, wouldn’t call myself a Christian… or Buddhist or Jew, Hindu or Jedi for that matter but I have a strong sense of universal spirit, of unity and a connection with all that is. I don’t distinguish much between the terms God, Life and Love, they’re all the same thing to me. I’ve been consciously working on my spiritual awakening since before I started blogging – it’s the inside job that I referred to recently when I wrote about my uncivilized life, but I still find it ridiculously difficult to write about it here. And yet I know that it’s a really important part of who I am and that my story is all the more difficult to understand when the spiritual aspects are left out. I was asked yesterday whether my hobo-ings had a spiritual element and I replied that yes, without that it’s just another crazy social media adventure, but that doesn’t make it any easier to talk about.